Color: Rose Gold Capacity: 14oz Temperature: Cold up to 9 hours and hot up to 3 hours Material: Thicker, Professional Grade - 18/8 Stainless Steel Lid: BPA-free, spillproof and shatterproof Tritan lid Straw: Reusable, polypropylene straw Enjoy MORE wine with LESS refills in our 14oz stemless wine cup! And then run it through your dishwasher and fill it up again. Yep, it’s DISHWASHER SAFE and also comes with a spill-proof lid, a slip-resistant silicone base, and even a matching straw for those girls who want to keep their lip gloss perfect. These NEW 14oz Stemless Wine Cups feature the same great technology that Swig Life is known for, but with bigger and better features. 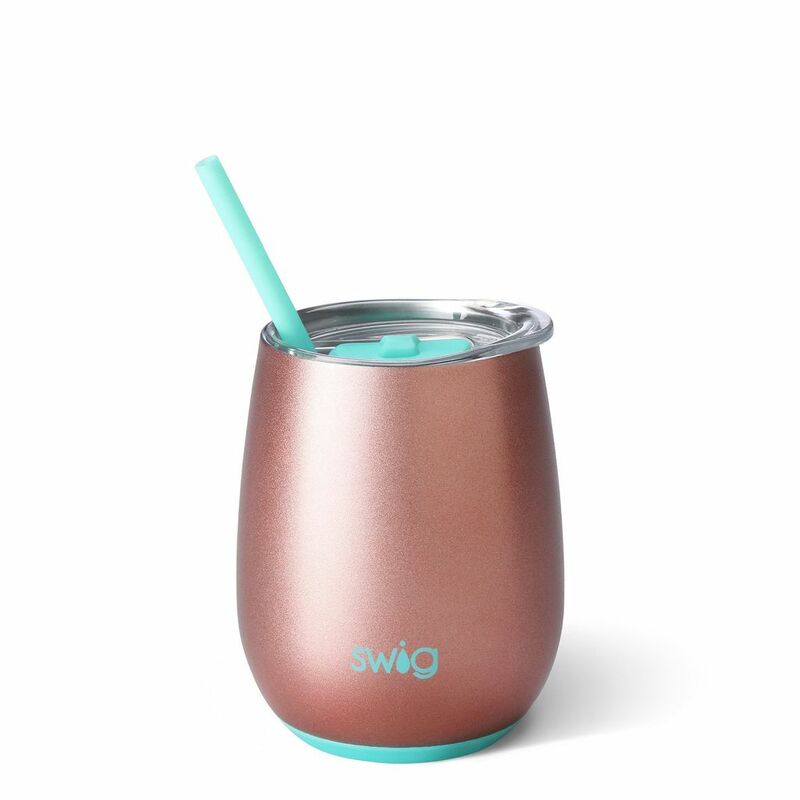 Each Signature Swig Life Stemless Wine Cup keeps drinks cold up to 9 hours and hot up to 3 with its double-wall, vacuum-sealed copper coated insulation. The non-slip silicone base keeps your cups from tipping or making too much noise when you set them down. The newly-designed SEAL-TITE Tritan lid is BPA free, spillproof and shatterproof. These clear lids seal tightly with a rubber seal gasket while allowing you to see inside. The straw friendly opening can be covered with the sliding closure to minimize spilling. Each Stemless Wine Cup also includes a reusable and dishwasher safe BPA-free polypropylene straw. Always use caution when handling hot liquids and please take care not to drink hot liquids from the straw.